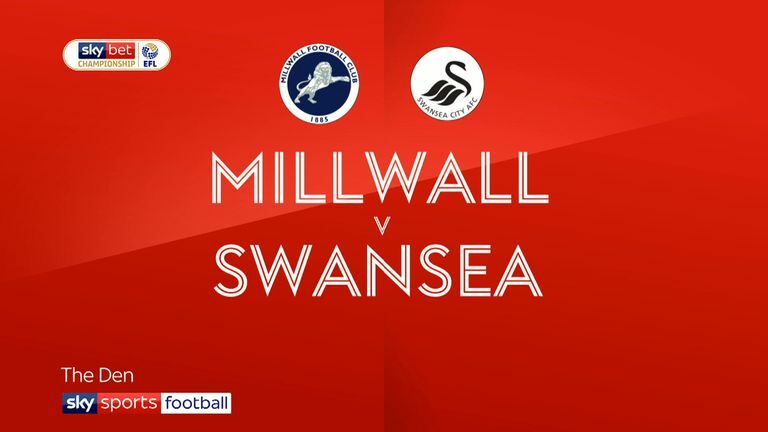 Oli McBurnie scored a dramatic winner as 10-man Swansea came from behind to beat Millwall in the Sky Bet Championship on Saturday evening. 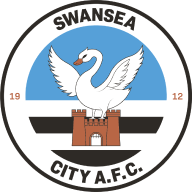 In a disastrous start, Courtney Baker-Richardson was shown a straight red card for his naïve lunge on James Meredith after five minutes, though Swansea soon adapted and successfully rode out the first half having kept their opponents at arm's length. But although the Lions hauled themselves on top when Murray Wallace headed home after 62 minutes, Swansea levelled proceedings when substitute Kyle Naughton tucked away Jefferson Montero's square ball. And Montero was the architect once more five minutes from time when he raced down the left flank and put a delightful low cross on a plate for Scotland striker McBurnie to tap home from inside the six-yard box and give Graham Potter's men their second league win of the campaign. The visitors got off to the worst possible start when Baker-Richardson - making his Championship debut - was sent off for a studs-up lunge on Meredith as he looked to rectify a poor touch, but they failed to let their disadvantage in personnel dampen their spirits. The Swans initially continued on the front foot, but plan B soon came into effect and they settled into their own half as the requirement to frustrate Neil Harris' men with a resilient back line took precedence. Jed Wallace spurned a great chance when he drove a shot wide from Steve Morison's knockdown and Swansea's afternoon took another turn for the worse when skipper Leroy Fer limped off after 35 minutes. It took the Lions an hour to edge themselves in front but they did so when Jake Cooper flicked Shaun Williams' corner onto the head of Murray Wallace, who diverted the ball beyond Erwin Mulder. But the goal only proved to spur on the Swans. Ben Amos made his first league start since arriving from Bolton on loan in place of Jordan Archer in goal, while Steve Morison replaced Tom Elliott in the only change from last Sunday’s Championship defeat to Rotherham. For Swansea, Daniel James, Leroy Fer and Matt Grimes came into the starting 11 following last weekend’s 1-0 reverse at home to Bristol City, while Courtney Baker-Richardson was handed his first Championship start by Graham Potter. Montero was soon introduced and it was the Ecuadorian winger's tenacity that soon drew the Welsh side level; he wrong-footed Mahlon Romeo and squared for Naughton, who rippled the back of the net when he arrowed in a tidy finish. Somehow, that wasn't all the visitors could conjure. 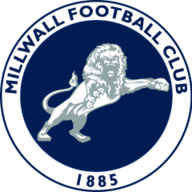 Millwall were left stunned with five minutes to play when Montero placed the ball into the six-yard box and McBurnie was left with the simple task of knocking the ball beyond home goalkeeper Ben Amos. 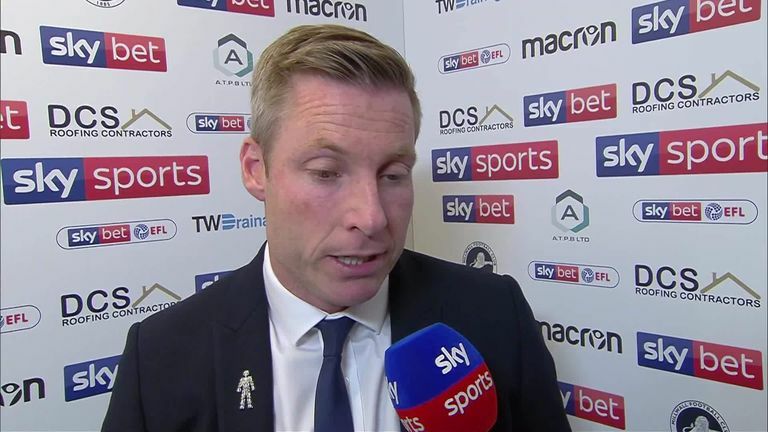 Neil Harris: "We're hugely disappointed; it's a game we've absolutely bossed. When you are playing against 10 men for 80-85 minutes, you shouldn't get beaten in the game, you should win the game. "We got our noses in front and it was always going to be tough to break them down, you get yourselves in front and when they start coming at you, you should be able to stand strong and then get them on the counter-attack. I've said a few choice words, I've got to be honest but I'll back my players all day long." 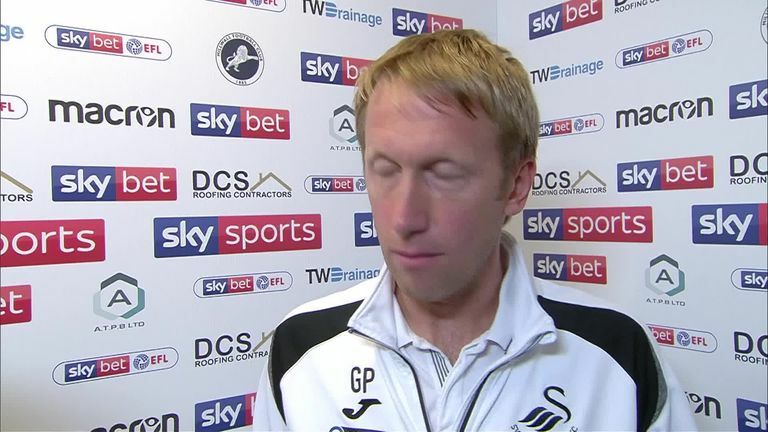 Graham Potter: "There was an incredible courage, to be honest - I'm so proud of them. We were thinking it was just going to be one of those days but it was 0-0 at half-time and of course you are going to come under pressure but we just had to deal with that. "We had to try and be brave. I thought in the second half, when we could we had to try and play our way out of the pressure and see if we could unsettle the environment, unsettle them and then try and create something." On the pitch for just 24 minutes plus stoppage time, the pocket-sized winger was the match-winner for Graham Potter's men, providing two wonderful deliveries that led to two goals within nine minutes. The Ecuadorian endured a difficult season in 2017/18 with loan spells in La Liga at Getafe and the Ecuadorian Serie A at Emelec, but with a performance such as the one he produced at the Den, a role within the Swansea squad could be on the horizon. Both sides are in home action on Saturday September 15: Swansea welcome Aitor Karanka's Nottingham Forest to the Liberty Stadium, while the Lions host high-flying Leeds.